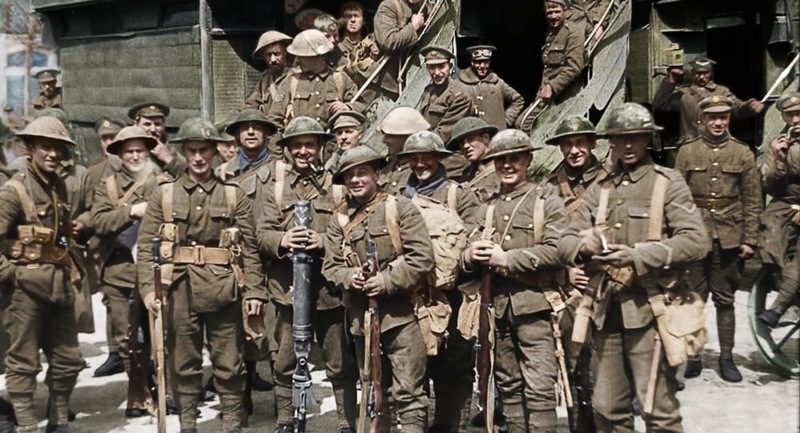 This past Monday, I went to a screening of Peter Jackson’s new WWI documentary, They Shall Not Grow Old. I went into the theater with high expectations, and this film definitely surpassed all of them. It brings to life the old archival footage in a way that has never been seen before. It truly allows you to travel back in time, and to experience history as the soldiers saw it. This film will be the closest you’ll ever be to actually experiencing the life of a WWI soldier on the Western Front, and horrors of war that they saw. It is a fitting tribute to the men and women who lived and died during this war. The film was narrated using old archival audio of WWI veterans, which allows them to tell us their stories in their own words. They are the only narrator voices that you hear. However, I was initially taken aback, since the beginning of the film starts with the standard, unrestored WWI footage. We saw the start of the war, the men enlisting and training, in black and white, and then, all of the sudden, the film took a turn when the men arrived at the front lines. I got chills when the film suddenly changed from black and white to color, from 2D to 3D, silent to audible, and from fast, shaky images to smooth, natural scenes. It was like all of the sudden, I stepped through the film, back in time, into their real world. I wanted to see this film, because my great-grandfather Glenn Kaiser served in the American Army in WWI. (As you may know from previous blog posts.) I wanted to better understand his experience during his time in the war. This year, I have been working on digitizing and transcribing his letters that he sent home during WWI. His words and his face were on my mind while I was watching this film. 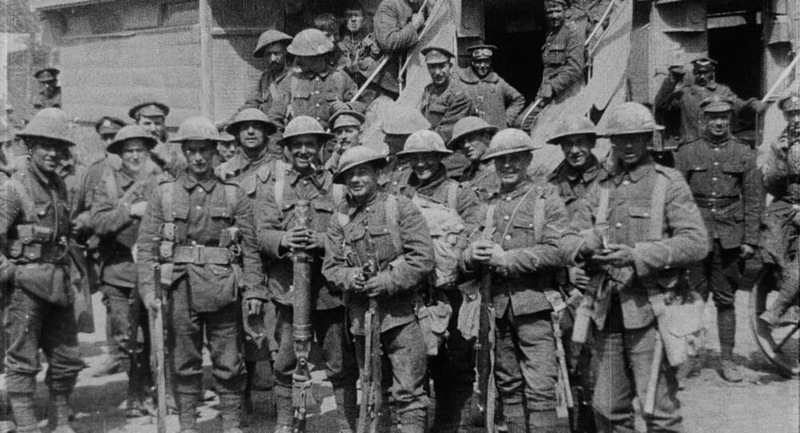 Although the film footage almost entirely featured British troops on the Western Front, the experience of war that was portrayed was shared among nearly all soldiers at the front, regardless of their nationality. Their voices and faces could have just as easily been my great-grandfather’s voice and face, and in some cases, what they described in the film was exactly what my great-grandfather described in his letters. (For instance, one soldier described the sleeping conditions at the front lines. The men had to sleep anywhere; in the mud, in the cold, standing up. The soldier described how he longed for his bed at home while he was at the front, but when he finally got home after the war, his mother found him sleeping on the floor, because he was the most comfortable there. In this letter, my great-grandfather described how he used to think that his bed was the worst one in town, but longed to sleep in it now. But, “don’t say anything if you see me sleeping on the floor because I can sleep anywhere if there is no shooting or any airplanes bombing!”) I thought I understood his experience after reading his letters and researching his unit. This film gave me a whole new level of understanding of what he experienced and the horrors of war that he saw. I appreciated that the film did not pass judgement on the events of the war, or vilify the Germans. Jackson tried to present an unbiased view of the war. He showed the humanity of the soldiers on both sides of the war when possible. The film also portrayed a lot of the everyday, mundane life of the typical soldier that is not often seen in other documentaries. Some of the best sequences are describing the mischief that they got into while “on rest” from the front lines, or how they occupied their time in the trenches. The end of the film left me feeling weary and somber. These soldiers went through hell during the war, and I can’t imagine how they kept their sanity and sense of humor. (My great-grandfather wrote, “The old saying is a Amex [i.e. American Expeditionary Forces] soldier is kidding all the time; if he didn’t kid he would be no soldier.” They kept their sanity and humanity by finding humor in everything and anything that they could.) At the end of the war, the men were so weary that they did not celebrate their victory, and, just like my great-grandfather, just listened to the silence and took the opportunity to sleep. The veteran narrators lamented that when they got back home, the general public and their own families did not understand what they went through. No one wanted to talk about the war, and no one appreciated their sacrifices. For me, the indifference of their countrymen toward their experiences was almost as heartbreaking as their actual experiences in the war. Their stories have been forgotten and hidden, and with this film, they are finally making their way back into the spotlight. This film was heavy and weighty at times, but it made a lasting impression on me. This movie is not for the disinterested or the faint-hearted. Some sequences, including the sequence describing the heat of battle, are a little long, and understandably don’t have any film footage of the actual battle. (It was much too dangerous for the cameramen to film during the battle!) There are also a lot of scenes that include blood, wounds, dead and dying soldiers, rats, and other horrors of war. Whenever I felt a little uncomfortable at seeing the dead bodies and blood, I remembered that boys as young as 14 and 15 were soldiers in this war, and these scenes were daily life for these men for several years. I can’t imagine the emotional and psychological trauma that they experienced after this war. I highly recommend staying after the credits to watch the mini-documentary about the making of the film. Peter Jackson describes how the project started four years ago with the Imperial War Museum, and walked us through the many creative decisions that went into the making of the film. Every decision he made was intended to give the audience an experience that was as authentic and historically accurate as possible. They watched over 100 hours of film from the Imperial War Museum, and over 600 hours of audio recordings from the veterans themselves. They took the archival film footage, slowed it down to a more natural speed, balanced the light and contrast of the footage to reveal amazing scenes, restored damaged images, and was able to crop and zoom into various parts of the screen to give the film a more modern feel. They meticulously colorized the footage, even using actual uniforms and artifacts from WWI to make sure that the colors matched. They made the film 3D, but the 3D elements were not at all distracting from the content of the film. They used audio recordings of the men that actually experienced the war (WWI veterans) to narrate the entire film. They re-created all of the sounds of the movements and weapons. They even brought in professional lip-readers to figure out what the men were saying in each shot, and brought in actors from the same region as the speaking soldier to provide an authentic accent. Every decision was made to make sure that every detail was as authentic as possible. This tedious and meticulous attention to detail definitely paid off. As a family historian, librarian, future archivist, and American, I really appreciate the amount of conscientious work that went into the creation of They Shall Not Grow Old. This film is a must-see for anyone who wants to know what life was really like as a WWI soldier. Especially for those with relatives that served during WWI, do not miss an opportunity to view this film It was immersive, remarkable, unforgettable. To Peter Jackson and all those who worked on this project, thank you for preserving, restoring, and sharing the voices and the faces of the Lost Generation. They are able to tell us their stories in their own words. They have come back to life. This film was aired on the BBC on Nov. 11, 1918 for the 100th anniversary of the Armistice. American audiences got their first chance to see the film on Monday, Dec. 17, 2018, when Fathom Events had two showtimes in theaters nationwide. The film broke records for Fathom Events, making it their largest documentary screening ever. I went to the evening showing at my local theater, and the theater was packed! (Upcoming showings are next week on December 27, 2018 – check for your local showings here.) It seems that the film will be shown again at general theaters in the U.S. in 2019, and I hope it will be on DVD soon. Don’t miss it! This one is on my must watch list. I have a grandfather and a great-uncle who served in WWI. Both were wounded in battle by gas. Yes, this will be on my must-watch list for 2019. Two of my great uncles served, as well as several of my husband’s great uncles. Thanks for the detailed review and the hint about the documentary at the end! Thanks! I’m not sure if that mini-doc will be released with the rest of the film in the general release next year, but it should be shown on Dec. 27 during those screenings. I’m also hoping it’s included in the DVD extra features because I’d like to see it again! Eva, this film is getting added to my must-watch list, also. I am the adult services librarian at a small Indiana library. As soon as this movie gets released on DVD, I plan on buying it for our patrons to watch. I also am a librarian, and our patrons have already started asking for it. We’ll definitely be purchasing it for our collection! There were a few genuine battle scenes in the production , mainly taken from Geoffrey Malins and John McDowell’s film “Battle of the Somme” filmed, in part, on the front line prior to the catastrophic British offensive of the 1 July 1916. To take an obvious example, the scene of the mine exploding was originally filmed at 07:20 on that day at Hawthorn Redoubt near Beaumont Hamel. Agreed that a number of the “battle” scenes were staged but a some weren’t. This additional information makes me even more eager to see the film! Thanks for the feedback. I should have said that there weren’t many battle scenes that could have been included. Thanks for sharing the original film clip! Digging around on YouTube and I found the complete “Battle of the Somme”. If you have seen “They shall not grow old” you might recognise some scenes. To put the losses on the Somme into perspective, the Lancashire Fusiliers shown at 26:20 lost about 170 killed and about 300 wounded out of a strength of about 1000 men. In other words: within about half an hour of that scene being shot a fair percentage of those shown were either dead or wounded. Thanks for the perspective. It’s hard to imagine such devastating losses. These were brave men. It never ceases to amaze me how much access to history the Internet has given us.